There is one very well known photograph of Kereopa Te Rau. This was taken by Samuel Carnell, an outstanding Napier photographer on the 8th December 1871. Kereopa by this time was in the Napier Prison, awaiting his trial - and he knew already - his execution. He knew this because he had already tried to exit the situation. Walking into Napier Prison a cut-throat razor slipped out of his clothes - before he could be searched. Incredibly quickly, given he was handcuffed, he managed to grab the razor and slit his throat. Though blood went everywhere, he did not die - he missed the major artery - and soon three doctors were on site, and one, Dr Hitchings, expertly sewed his throat up. 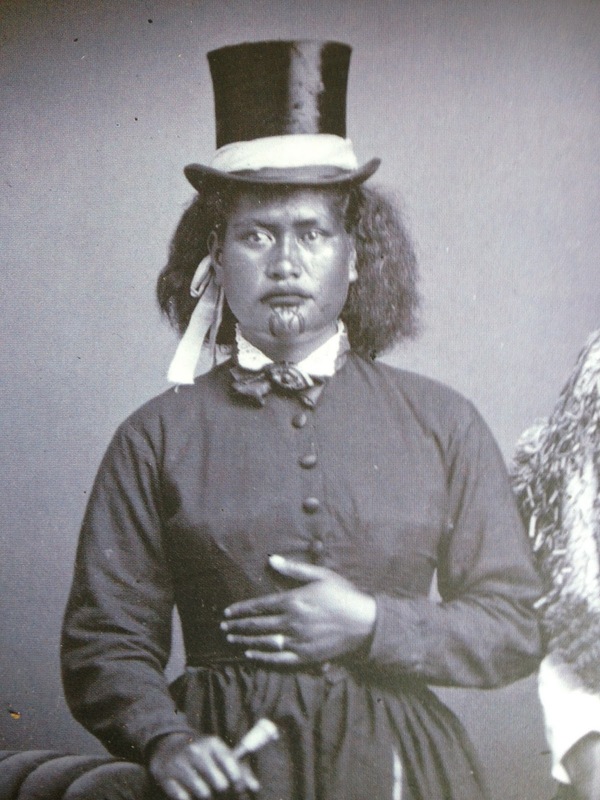 The photograph by Carnell shows Kereopa's misery. Carnell would have brought the props - ie Maori cloak - to the prison, so he looked 'legitimately' Maori. Perhaps because Kereopa looks so very pensive and sad, Carnell also overdrew, on the negative, his moko. This was an attempt to make a man whom many Pakeha saw as a terrorist look more 'terrifying'. The photo would have been hot property, as people in the 19th century collected photographs of all sorts of people - royalty, celebrity midgets, circus performers, murderers, notorious poisoners, famous whores, beautiful society women, notable men like parliamentarians. It had an element about it of kids collecting certain kinds of cards. Also photography, as a relatively new invention, delivered the news of what someone actually looked like - across space and time. In its own way it was remarkable. Carnell later went on to be the chosen photographer for Hawke's Bay Maori. They felt at ease preening in front of his camera, rarely choosing to wear by-then 'antique' Maori costume. Instead they chose high status Pakeha outfits, refitted to ensure their own identity was recognised, mixed in with moko and other identifiable Maori elements. These were collected in a fine book called Nga Tamata which you can still find in bookshops. But my mystery began with an idle evening recently when I did the obvious (which sometimes occurs quite late in research.) I googled Te Papa to see what they had of Kereopa Te Rau. The two photos they had of him were from the same image - the famous (or infamous) one. 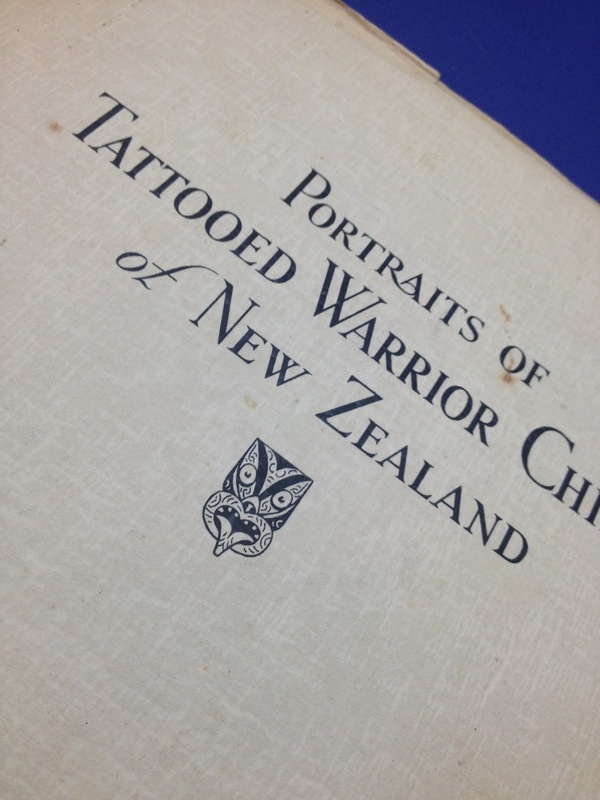 But I also noted there was another image, not on-line because permission from his iwi was needed. This piqued my curiosity immensely, as I was eager to see another image of Kereopa. I knew Carnell had taken several photographs. The curator at Te Papa kindly sent me an image which could not however be copied or used publicly. The image showed a rather plump man, once again wearing antique costume, holding a patu. He had none of the pensive grief in the well known portrait which is so affecting. He looked relatively ordinary. When I asked the curator if she knew if it was indeed the famous Pai Marire warrior and prophet - and murderer? - she said the image came from a book called 'Portraits of Tattooed Warrior Chiefs of NZ: The Millard Collection'. The book was unavailable at Te Papa because something was happening in the library. I asked my friendly source at Napier Library, Steve Knowles, to try and find where else I could look at the book. I was fascinated to see if there was any further context. Lo and behold there was a copy at the local EIT, in Taradale, in a special bookcase. This morning I arranged to go out and look at it. The glass case was unlocked and I was given the book - really a booklet - and told I could look at it right by the librarians, where I was publicly viewable. The EIT librarian had already told me an image of Kereopa did not appear to be there. And sure enough, it wasn't. But then….some curiosity awoke in me. I looked very carefully at the binding and counted only nine images where it was clear there should be ten. And when I looked even more closely, I thought I could see where a page had been ripped out. But was it Kereopa Te Rau? I glanced at the single page introduction. It was a curious piece for both its date - 1942 - and the person writing. 1942 was a strange date for a book, as this was the time in the 20th century when it was quite possible German and Japanese fascism would triumph and the course of history changed forever. Only Britain and its empire fought against fascism, and it was quite conceivable the battle would be lost. After the fall of Singapore and it was clear the Japanese could reach Australia and New Zealand with impunity, NZ's army was sent to Egypt - to fight German and Italian fascism. So New Zealand was very exposed. a sort of pride or interest in NZ-specific history. It was introduced by 'Victor R Millard' from the Royal College of Art, a sculpture student. In terms of content it would seem that the ripped out page was indeed meant to represent Kereopa Te Rau. Anyway, long story short, I am going to have to find a hopefully complete booklet and see whether it does say it is Kereopa Te Rau - or whether it simply says the person is "Kereopa" - which was how Te Rau was pretty much uniformly known in the 19th century global press. 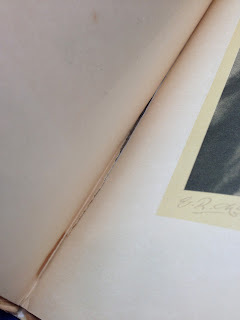 My mystery is this: did the person ripping the page out do so because of his notoriety - or did the person rip the page out to protect his privacy, his mana? That product established fact designed for marking bamboo bedding holders with the Gucci designer handbag, an authentic cartier replica sale relocate which inturn in the end got that designation among the a good number of contemporary brandnames on expensive clothing and even accents. That product moreover established ones own brand striped webbing producing from that seat thickness with the 1950s. A lot of these inventive design omega replica sale given a singular and even contemporary bench mark per each Gucci designer handbag manufactured. The state Gucci websites gives you a good amount of fashion, accents and even affordable handbags each individual clear for their awareness in pattern and even stunning elegance. I really hope culture belonging to the bamboo bedding work with, the fresh new Bamboo bedding sizeable top notch work with backpack is without a doubt snazzy model bespoked through bamboo bedding. The application is manufactured out of flagstone wash rag and even forced through pennie computer and even organic and natural textiles stomach lining. That particular work with is manufactured out of bamboo bedding through threaded feature and even 5 in get rid of. That flap is known for a turn-lock drawing a line under moreover comprised of bamboo bedding. That backpack shows a a few rolex replica sale detachable connectors on clear wash rag and even braided wash rag through aluminum chain. in Geneva headquarters, Replica Watches is special for this project.Before the end of 2015, MMT will release the different models of 10 under the Rolex Daytona Smartwatches flag. They are divided between the brand of Frederique Constant, Alpena includes models of Replica watches UK men and women. The model number of the only two remaining details, taken from the brand, Replica handbags but will be published has been provided by the handbagreplica March Baselworld show.